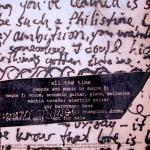 The third, promo only, single taken from Magne's album "Past Perfect Future Tense" was "All The Time". It features only the title track and although the track running time is 4:28, the track actually finishes after 4:22, consist with the album track length. The disc comes with a folded picture sleeve which features a red-tone picture of Magne's head and shoulders in front of a microphone. Beisde the picture is a section of artwork as used on the cover of the album. 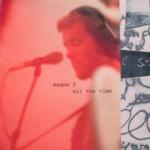 "magne f all the time" is printed in the middle of the sleeve. The reverse of the folded insert features more of the black and white artwork as found on the album cover. Over the black shape at the bottom of the sleeve are some details about the track plus the text "promotion only - not for sale". On the cover, it says "copyright 2005 Passionfruit. Exclusively licensed to Private and Confidential Records Ltd. Manufactured in the UK", suggesting that it was meant for the UK market, but perhaps never released. The disc is white with black text. "Promotion only - not for sale" is printed down the side of the disc and the copyright details say "2004 Passionfruit" (compared with 2005 on the sleeve).